As ahead of the curve as this upstart company has proven with their non-assist road and mountain bikes, Canyon have been pretty late to the game when it comes to e-bikes. Apparently, they’ve been waiting for the market to stabilize before introducing their interpretation of what a proper e-MTB should look like. The aluminum Spectral:ON 8.0 bike is built around the Shimano STEPS E8000 system with standard Shimano controls and display. Also available is the latest Shimano app that can be used to tune the various ride modes of the motor. The battery location is on the downtube and is removable, but it can also be charged on board. The wheel package is provided in a mixed format with a 29-inch front wheel mated to a 27.5-plus-inch rear hoop. The suspension system is a classic four-bar design that everyone seems to be using nowadays. Cable routing is internal, and there is space for a bottle holder. One neat finish we noted is the integrated seat post clamp. Very aggressive: You immediately notice the record-short chainstays and the raised-up shape of the rear of the saddle, both suggesting you to attack the steepest trails. The bottle cage is, of course, a side-loader type. Our test version was one level below the top of the range with a 160mm fork mounted. The different wheel sizes give different wheel widths with well-chosen tires to meet the different demands in the front and rear. To keep the prices competitive, Canyon has made small component-choice cost savings, which keeps the bike performing well in the most important elements they consider necessary. It’s worth noting that Canyon made a name for themselves as a consumer-direct company, so the bike comes to you direct from Canyon already set up in the box. Everything works perfectly immediately, with clear instructions on how to make the bike ready to ride. Shimano makes excellent motors; however, their tuning has been under development since day one with constant updates for power and transition settings. The test version on the Canyon needed us to spend some time making the trail/boost transition more to our liking. The display screen is great, and we love how it fits behind the handlebar out of harm’s way. Very few have such a good power switch as Shimano on the market. The electromechanical feel seems right for this type of bike, and keeps traditionalists and modernists happy at the same time. Great handling: You may choose among two settings in the geometries. In the end, we stayed with the most aggressive one without sacrificing any noticeable amount of agility in the tightest singletrack when bombing downhill. The Canyon is aimed at the rider who wants a comfortable ride and looking for a bike that can take on a lot of different types of trails. The build quality is good, and the price for performance is probably better for those who have more restricted budgets but want something with a quality feel. If you want a high-performance machine, we would recommend that the Spectral:ON is more for the easy-going rider so we would look elsewhere, or we would need to spend time on the shock tune. Canyon makes quality products, so as the market matures, we are looking to see what else comes out of their design house that hits the high-performance end of the market. The Canyon has a longer-than-average reach and is easy to set up the suspension and cockpit to give the rider a comfortable riding position. Pedaling along the bike trail is smooth and responsive to trail inputs. Cornering is precise and predictable, and there is no difficulty in trying to find a good body position and staying balanced. The Spectral:ON is obviously a heavier bike, and although ready to climb in most instances, we found our motor tune to have too much difference between trail and boost; however, this can be changed in the app. The transmission works well, and the bike likes to be pedaled and maintains a constant cadence. As the speed picks up, the bike remains very ridable, and we found the geometry to be right for our speed aims. The rear suspension is somewhat softer in the mid-stroke than we preferred, but this is ideal for the general bike user who is not pushing the limits. However, the Spectral:ON does allow the rider to feel safe at speed and in rough sections. The Shimano system is particularly appreciated because of its ergonomics and minimal visual impact. There’s no clunky stuff clogging your handlebar. We love the configurability of the motor via the eTube app. There are three power modes—eco, trail and boost. Eco gives a little more help than just overcoming the weight of the bike and is good for a workout. Trail is about double that and, from the factory, it always feels like 30 percent. Boost is the full-beans, 100-percent power. The steps between trail and boost are too big, and Boost is usually more power than we need. We dialed up trail to be more in the middle of the power range and set boost back to about 80 percent for a much more controllable ride and better range. Your mileage may vary, depending on what you’re climbing. You may want all Boost, all the time just for the fun factor! Shifting was easy, even under load, making climbs easier. There’s no shift detection, so it is advised to let up on the pedals as you shift. It was odd to see a Shimano crankset and motor mated with a SRAM shifter, derailleur, chain and eight-speed cassette. While the shift performance was consistent, we disliked the eight-tooth step in the last four cogs. 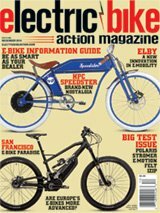 We’ll never understand why the EX-1 has been specifically dedicated to e-bikes by SRAM. One of our riders took out the Spectral:ON and did some laps around a local loop. He did the first loops with the suspension locked out, and then he opened it up. He never used all the suspension, even on bigger stuff. When the suspension on this bike was set correctly, it had good small-bump compliance and was very forgiving over bigger stuff. Powerful brakes: The Code is the most powerful brake in SRAM’s line of components. Not needed? Maybe, but still very much welcome, thanks to its great modulation. The Maxxis tires gripped like crazy on climbs providing spin-free pedaling on steep climbs. The geometry helps, especially on super-steep stuff. It didn’t feel like it wanted to loop out, ever. You can lock out the suspension if you want, but even wide open, it stays where you want it. Descents were a total blast! We couldn’t get enough, and climbing back up is always fun too. Shimano STEPS E8000: It’s the choice of more brands now because of how finely it supported your efforts. The Canyon Spectral:ON 8.0 sits among some of the better bikes on the market. It is balanced and safe with lots of fun stored up. We liked it a lot and had a lot of fun during our test ride. We would prefer a different motor tune, which is Shimano-related, not Canyon, and always being adjusted as different firmware updates come out. As of this writing, Canyon’s consumer-direct model only allows the shipment of the non-assist Spectral to North America, but here’s to hoping that the pedal-assist version will arrive in due time.